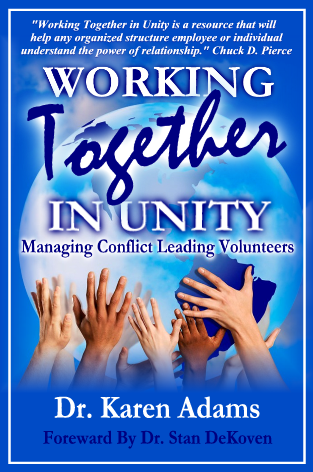 Working Together in Unity - Book PreviewManaging conflict and keeping four generations of volunteers actively engaged in the 21st Century workplace is a daunting task. However, by adopting the strategies offered in this book, you will be equipped to tap into the passion and excellence that your volunteers bring to your organization. You will be known as a leader who has the knowledge, skills and ability to inspire and motivate each generation of workers and volunteers to reach their peak performance. Armed with these new tools, you will be able to creatively lead your organization’s volunteer programs to their highest level of achievement! Managing conflict and keeping four generations of volunteers actively engaged in the 21st Century workplace is a daunting task. However, by adopting the strategies offered in this book, you will be equipped to tap into the passion and excellence that your volunteers bring to your organization. You will be known as a leader who has the knowledge, skills and ability to inspire and motivate each generation of workers and volunteers to reach their peak performance. Armed with these new tools, you will be able to creatively lead your organization’s volunteer programs to their highest level of achievement! Create a positive environment conducive to building long-lasting relationships. To accomplish these stated goals, a series of five specially selected communication models and theories will be analyzed and discussed. Section 1 concludes with a comprehensive discussion on the Attribution Theory, judgmental biases, prejudices and passions and the Groupthink Theory. Build bridges across 4 generations of paid and unpaid staff members and volunteers to maintain a harmonious work environment.